The University of Texas at Austin set a goal to have 70 percent of its students graduate in four years by 2017. It fell short — but managed to lift up the prospects of its poor and minority students in the process. On paper, Alisandra Sada’s chances of graduating on time were slim when she showed up as a freshman at the University of Texas at Austin in 2014. She came from Dilley, a town south of San Antonio with one-twelfth the population of UT-Austin’s student body. Neither of her parents went to college, and she graduated from a high school where just 13 percent of students finish ready for college-level English and math courses. But if all goes as expected over the next eight months, she’ll beat the odds and earn her diploma on time. And compared to just a few years earlier, far more of her peers will do the same. UT-Austin has spent the past five years focused on getting more of its students to graduate in four years. In 2012, 52 percent did so — the highest rate for a public university in the state, but far lower than at other top-flight public colleges nationwide. The goal was to get that rate up to 70 percent by 2017. On Wednesday, the university plans to announce that it fell short of that goal — just under 66 percent of undergraduates who enrolled in 2013 graduated within four years. But that still represents a nearly 14 percentage point increase in five years, which school officials say is a major gain for the university and the state. "I am very proud of what UT has done," said university President Greg Fenves. Notably, much of the increase has come from gains made by the school’s minority and lower-income students. In 2012, the four-year graduation rate was 20 percentage points lower for UT-Austin's poorest students than it was for its richest. Now, that gap is 11 points. And the overall graduation rate for students whose parents earn less than $40,000 per year has grown from 38 percent to 58 percent. Meanwhile, black students’ four-year graduation rates went up from 37 percent to 58 percent. The rate for Hispanic students grew from 43 percent to 60 percent. That progress is important for how the school is perceived. Many view the four-year graduation rate as a marker of quality, and the number is taken into consideration in rankings by U.S. News and World Report and other publications. 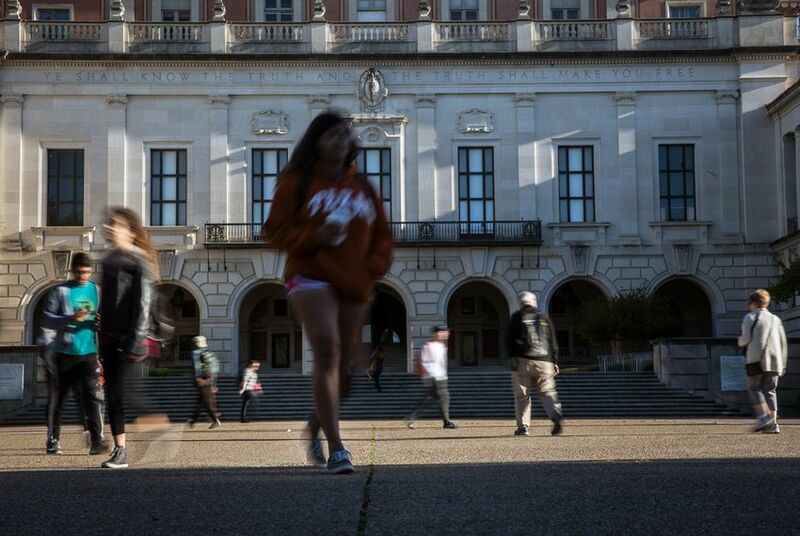 Fenves downplayed that impact, saying a 70 percent rate should be expected of UT-Austin. When he arrived at the university as dean of engineering in 2008, “I thought there was a glaring difference” compared to other top schools, he said. “I don’t expect we will get a lot of recognition for meeting a benchmark that a lot of other schools have already met,” he said. But the impact on students has been significant. Each additional semester of college adds to a student’s expenses and cuts down on the time during which he or she could be earning money as a professional. Plus, Fenves said, graduating more students in four years makes the university more efficient. With more students leaving on time, UT-Austin is able to enroll more freshmen without adding to the total number of students on campus. That means it can educate more people in the long run with fewer building space needs and a faculty that isn't as thinly stretched. UT-Austin began its quest to raise its graduation rate in 2012. A 14-person committee compiled a 111-page report laying out work that needed to be done in order to improve rates. That work included pushing students to pick a major earlier and stick with it, and eliminating a culture where it was considered acceptable to stay in college for five years. But university officials highlighted the work they have done to help their most vulnerable students. Using data analysis, the school found the traits that made students most likely to drop out or take longer to complete their degrees and then offered the students with those traits financial and academic resources to keep them on track. Sada fell into that group and was one of 500 students in her class assigned to the University Leadership Network. The ULN offers member students a $20,000 scholarship, paid in monthly increments over their college careers. To keep getting the money, students have to maintain a 2.0 GPA and stay enrolled in a full course load in order to graduate on time. They also have to complete an on-campus internship. The students are also expected to participate in small groups designed to provide advice from older students, support from peers and a feeling of community on such a large campus. That was true for Sada, who struggled with her first round of midterms freshman year. She’s on track to graduate this year with a degree in family sciences, and she hopes to work for the state’s Early Childhood Intervention Program, which helps families with children under 3 who have developmental delays or disabilities. UT-Austin leaders say Sada's success — and the work she’ll do after graduation — shows the value of getting students through school quickly. But they know they still have work to do to reach their goal. “We will get to 70 percent,” Fenves said.